I love the combination of rhubarb, raspberries and rose water, but if you prefer something less floral simply substitute the rose water for vanilla extract. Fruit: Chop the rhubarb into 5cm lengths. Put in a single layer in a roasting pan and sprinkle with rose water, sugar and water. Roast for 15-20 minutes, until soft but not mushy. Fold through raspberries and leave to cool in the pan then drain off the rhubarb juices. Trifle: In a mixer, whisk the egg yolks, ½ cup sugar and the vanilla bean paste until really thick and pale, for about 5 minutes. Add the mascarpone and beat to combine. In a separate bowl whisk two of the egg whites with the remaining 2 tablespoons of sugar until they hold soft peaks. Whip 200ml of the cream to soft peaks. Gently fold the egg whites into the egg yolk mixture, then fold in the cream. Put the water, sugar and rose water in a small pot and bring to the boil. Simmer for 5 minutes, remove from heat and pour into a jug to cool. Once it has cooled a little, add the Vanilla Galliano and the reserved rhubarb juices from the roast rhubarb. Slice the trifle sponge into fingers. Line the base the dish with trifle fingers, then spoon over ½ of the rose water liqueur syrup. Place a layer of rhubarb and raspberries on top. Plop a layer of mascarpone custard on top and smooth out then repeat with another layer of trifle fingers, the remaining liqueur syrup, rhubarb, raspberries and custard. Cover with cling film and chill at least 8 hours or overnight. Just before serving whip the remaining cream and fully cover the final mascarpone custard layer. Top with Persian Fairy Floss and the crushed Praline. Praline: Line a small baking tray with baking paper. Whisk the sugar and water together in a medium saucepan. Cook over a medium heat for a few minutes, whisking as the sugar dissolves, then brush any sugar on the sides of the pan into the water with a pastry brush, and don’t whisk again. The sugar will go through several stages: first it will dissolve, then become white and crystallised, and finally it will start to turn lightly golden and liquid. Gently swirl the saucepan at this stage to encourage even cooking. Once it is an even, light golden colour (similar to honey), pour it out on to the prepared tray. It will continue to darken in colour even once poured. Once cooled (it doesn’t take long), smash the praline into large pieces with the end of a wooden spoon or rolling pin and/or blitz in a food processor to your desired texture, from large and chunky to a golden powder. 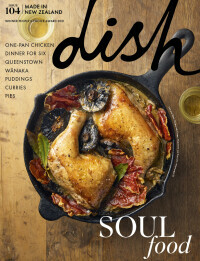 Sarah Tuck is a food writer and photographer based in Auckland. For more recipe ideas and cooking inspiration, visit her beautifully photographed blog, Stuck in the Kitchen. To read a little more about her and find out how Stuck in the Kitchen began, click here to read our story on her.